ELLSWORTH, Mathew Harris, a Representative from Oregon; born in Hoquiam, Grays Harbor County, Wash., September 17, 1899; moved with his parents to Eugene and later to Wendling, Oreg. 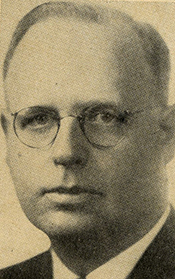 ; attended the public schools; served in the Student Army Training Corps during the First World War; was graduated in journalism from the University of Oregon at Eugene in 1922; advertising manager of a newspaper in Eugene, Oreg., in 1923; engaged in the lumber business 1923-1925; manager of a lumber-industry publication 1926-1928; associate professor in journalism at the University of Oregon in 1928 and 1929; publisher and part owner of the Roseburg (Oreg.) News-Review since 1929; served by appointment in the State senate in 1941; elected as a Republican to the Seventy-eighth and to the six succeeding Congresses (January 3, 1943-January 3, 1957); unsuccessful candidate for reelection in 1956 to the Eighty-fifth Congress; appointed by President Eisenhower as chairman of the Civil Service Commission for a two-year term and served from April 18, 1957, to February 28, 1959; resumed newspaper business profession; real estate broker; moved to Albuquerque, N.Mex., in 1975 and lived there until his death on February 7, 1986; interment in Gate of Heaven Cemetery.